If you are pregnant and happen to like to eat hot dogs, you probably have heard a few warnings. Hot dogs are an American favorite at barbecues, baseball games and social gatherings alike. Also known as frankfurters or wieners, hot dogs are cured meat made from pork, beef or poultry byproducts. Women are cautioned against consuming ready-to-eat foods such as cold cuts, soft cheeses and hot dogs during pregnancy because of the possibility of consuming harmful bacteria. With careful preparation, women may continue to enjoy hot dogs throughout pregnancy without fear of illness. Listeria monocytogenes is a genus of bacteria found in cold-cut deli meats, soft cheeses, and cured meats. This bacteria is responsible for causing listeriosis, an infection characterized by flu-like symptoms and gastrointestinal distress. Those particularly susceptible to listeriosis include elderly adults, small children, anyone with weakened immune functions and pregnant women. Listeriosis is particularly dangerous during pregnancy because it can lead to miscarriage, premature delivery, infection or even death to the baby. Listeria monocytogenes can be destroyed with heat. Even though hot dogs are considered precooked, it is important that you cook them sufficiently in order to eliminate the presence of bacteria. The risk for listeriosis is greatest when consuming uncooked deli meats; if not heated properly, bacteria will continue to thrive. Whether they are grilled, boiled or microwaved, your hot dogs should be steaming and served hot. Do not allow the hot dogs to become cold or you risk further contamination. 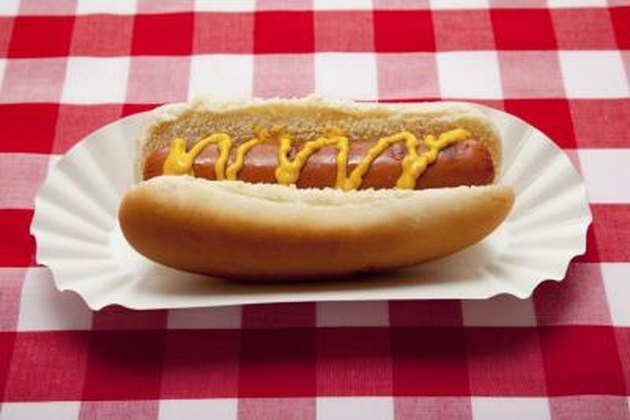 Additional concerns associated with hot dog consumption are sodium nitrates. Sodium nitrates and nitrites are compounds manufactured and used as food preservatives to enhance color and extend shelf-life. As food preservatives, they prevent the formation of harmful bacteria such as Listeria monocytogenes and Clostridium botulinum. A study conducted by Dr. Ute Nothlings, et al, in the 2007 Journal of Epidemiology revealed that participants who consumed processed meats in large amounts had a high risk of pancreatic cancer. Sodium nitrites are also associated with causing damage to blood vessels thus increasing the risk for developing heart disease. If you want to avoid risks associated with bacteria or nitrates but still enjoy hot dogs, there are alternatives. Meat-free options exist on the market that are made from soy-meat substitutes, grains and vegetables. These vegetarian friendly options are also lower in fat compared to traditional hot dogs. Can a Pregnant Woman Eat Smoked Meats?